Freedom Fruit Gardens is the work of artist A.D.Schierning, it is a project that aims to plant edible gardens throughout New Zealand. Creating increased accessibility to the simple pleasure of harvesting and eating fruit straight from the tree. When given an apple you can eat an apple, when given an apple tree you can enjoy many apples. Fruit freed from consumer society and a reminder that food is something that does not initially come from a supermarket. 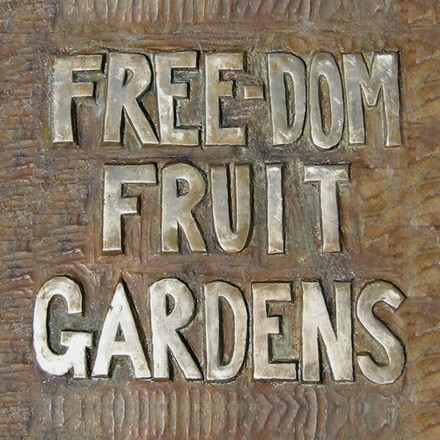 ‘Freedom Fruit Gardens’ hails from a movement within society to promote a dying art within urban space. Farmers markets and community gardens are increasing at an exponential rate. Each site for planting is chosen using a statistical scale called the ’Deprivation Index’. The index uses census information (income, the number of people living in a dwelling, cars per household etc) to statistically rate each population block of approximately 86 people (mesh block) within N.Z on a scale of one to ten, ten being the most financially deprived. Using the ‘Deprivation Index’ to map the area that statistically has the most condensed financial deprivation. Once this area is mapped out, a suitable and under-utilised plot of council owned parkland is found within its radius. Once this is established a proposal is put forward a to the relevant local council and community bodies to plant an orchard on this land. The inaugural planting of a Freedom Fruit garden occurred on Friday 25 June 2010, at Preston Road Reserve, East Otara, Manukau in collaboration with Te Tuhi Centre for the Arts. The site for the Preston Road Reserve orchard was also chosen because it boarders with Rongomai Primary School. The students of Rongomai elected the variety and number of fruit trees to be planted and helped with the actual planting. On the ground of Te Tuhi Centre for the Arts is a lemon tree grove that links the project to its origin and the community to the gallery. The second Freedom Fruit Garden was planted on the 7th of September 2010 at Walter Nash Park, Taita, Lower Hutt in collaboration with The Dowse Art Museum. Winter 2011 The Dowse Art Museum will be redeveloping the outdoor area in front of their building. Within this development is another planned planting to connect the gallery with the larger orchard in Taita. Freedom Fruit Gardens success relies on the ongoing support from Te Tuhi Centre for the Arts, The Dowse Art Museum, Manukau City Council, Hutt City Council, Waimea Nurseries, Rongamai Primary School, Taita College, The Otara Community Board, Great Start Community Centre Taita, Vincent Perry, Chris Beard, Craig Cottrill, Robert Sly and Hardhat Design.